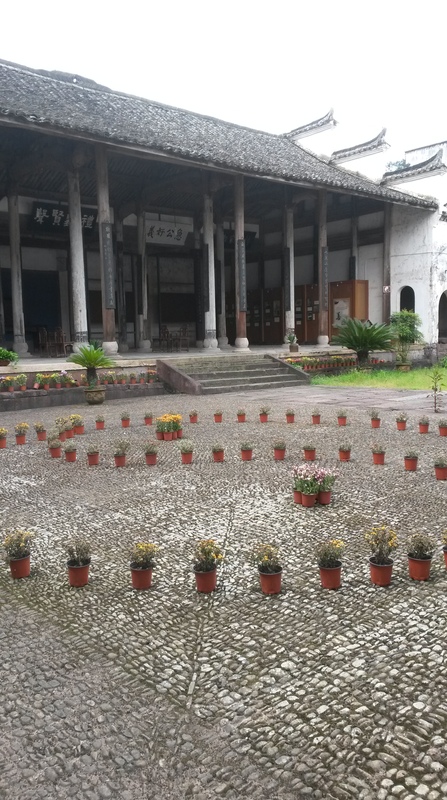 Yuyuan Ta Chi Ancient Village – Where's Mary? On the first Saturday of our stay in Suoyuan, we had a free day. The three of us living in our homestay were lucky to be invited to go with our hostesses’ brother-in-law to go to Yuyuan Ancient Village, about 45 minutes away. We left in the late morning, so the first stop was lunch. We ate lunch at a small restaurant in the typical style of rural China: everyone sharing a number of dishes, including freshwater fish, tofu, green beans, and several other foods. After lunch, we headed to the ancient village. Yuyuan is a Taiji (Tai Chi) astrological village, the only one in China. This means that the village is constructed in a pattern consistent with the principles of tai chi and Taoist astrology. This includes the seven wells that correspond to the Big Dipper, which is an important constellation in Taoist astrology. Also, the 11 mountains that surround the village plus the village itself represent the 12 palaces of the zodiac. There are 28 building blocks that represent the 28 lunar mansions of Chinese astrology. Everything in the village is arranged according to the principles of feng shui. The history of this arrangement dates back to the 1300s and is credited to Liu Bowen, a well-known war strategist and advisor to the first emperor of the Ming Dynasty, Zhu Yuanzhang. The story goes that Liu Bowen was good friends with one of the people in this village and often stayed with him when passing through the area. The village was plagued with natural disasters, including floods and droughts before Liu Bowen changed the layout of the village and changed its fortunes. Int the 800 years since it was changed, there have been no droughts or floods in the village. The Shangzhai stream divides Yuyuan into two halves. The main feature of the village is its water source, the Shangzhai Stream. This stream once flowed straight through the village, but now is an S-shaped curve. In addition to changing the course of the stream, Liu Bowen had trees planted on both banks that helped prevent soil erosion, helping to prevent both drought and flood. This stream divides Yuyuan into the two parts of the Yin Yang symbol. Traditionally, the Yu clan lived in the northern part, and the Li clan in the southern part. The Yu family is the most common, with about 70% of the roughly 2,000 people in the village having this surname. It is the largest concentration of people with this name in China. The first Yu ancestor moved to Yuyuan during the Southern Song Dynasty (1127-1279 AD). As the family grew and became more prominent, they built their Ancestral Shrine in the dipper part of the Big Dipper. 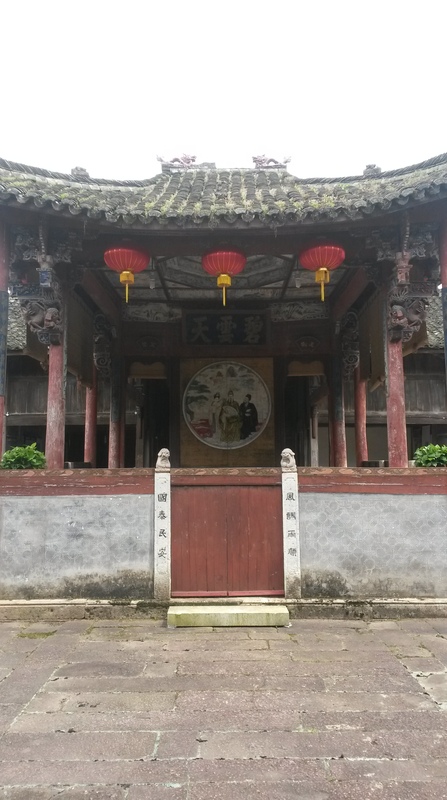 This ancestral shrine hall is typical for many Chinese villages. These halls were built by wealthy families as a place to honor their ancestors and perform religious ceremonies. The Ancestral Shrine of the Yu Lineage was actually confiscated by the government in the 1950s during the Great Leap Forward and the Cultural Revolution for use as a grain storage facility and was only returned to the Yu family in the 1990s. In addition to this huge hall, Yuyuan also has a large number of historic houses. Approximately 40 ancient houses in the village are still inhabited. Most of these historic houses were built during the Qing Dynasty. The village is recognized by the Chinese government as a national historic village and was one of the first to be recognized as such. This village has some potential for tourism but has a long way to go. Many of the sites were run-down and cluttered. Harvard University has done some research and work here (and throughout Jinhua), but it doesn’t appear as if much work has been done recently. Pingback: Jinhua Homestay Program 2016 – Where's Mary?